The Dardanelles, formerly known as the Hellespont, literally "Sea of Helle", is a narrow strait in northwestern Turkey connecting the Aegean Sea to the Sea of Marmara. It is one of the Turkish Straits, along with its counterpart the Bosphorus. It is located at approximately 40°13′N 26°26′E﻿ / ﻿40.217°N 26.433°E﻿ / 40.217; 26.433. The strait is 61 kilometres (38 mi) long but only 1.2 to 6 kilometres (0.75 to 4 mi) wide, averaging 55 metres (180 ft) deep with a maximum depth of 82 metres (300 ft). Water flows in both directions along the strait, from the Sea of Marmara to the Aegean via a surface current and in the opposite direction via an undercurrent. 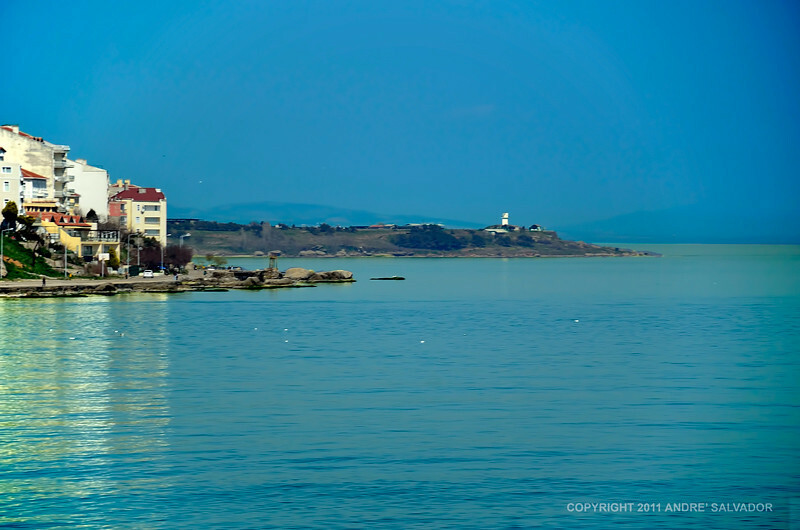 Like the Bosphorus, it separates Europe (the Gallipoli peninsula) from the mainland of Asia. The strait is an international waterway, and together with the Bosphorus, the Dardanelles connects the Black Sea to the Mediterranean Sea. A suspension bridge project has been planned, connecting Saricay (a district of Çanakkale) on the Asian side to Kilitbahir on the European side.